I like green labeling, but I’m not convinced that, by itself, it’s theoretically a viable way to get the economy to a good environmental endpoint. In practice, it’s probably even worse. Consider Energy Star. It’s supposed to be “helping us all save money and protect the environment through energy efficient products and practices.” The reality is that it gives low-quality information a veneer of authenticity, misleading consumers. I have no doubt that it has some benefits, especially through technology forcing, but it’s soooo much less than it could be. 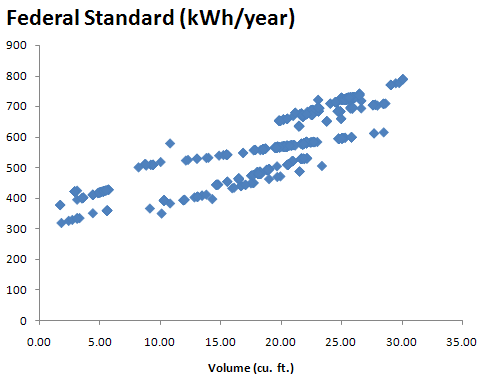 Notice that the standard for a 20 cubic foot fridge is anywhere from 470 to 660 kWh/year. At the large end, there seem to be many more non-compliant models. Perhaps this is because 10 to 20 cu ft fridges are cheap and therefore their energy bill is comparatively significant, while big fridges sell on their fancy features rather than energy performance. Certainly the more energy-intensive side of the spectrum is larded with premium brands, features like through-the-door ice access, and auxiliary uses like undercounter wine coolers. The graph shows physics at work. Power per volume should be roughly inversely proportional to size, due to the surface area to volume ratio. That holds, roughly, with power = k*volume^(-0.65). One implication is that small fridges have abominable power consumption per volume (but still some get stars among their peers). There’s an even larger difference between company claims and our measurements for the LG LMX25981ST French-door fridge. LG says it uses an Energy Star compliant 547 kWh per year. We found through our tests that real-life energy use would be more than double. Why the energy-use gap? DOE procedures call for a refrigerator’s icemaker to be off during testing. On the LG, turning off the icemaker also shuts off cooling to the ice-making compartment, located on the refrigerator door. 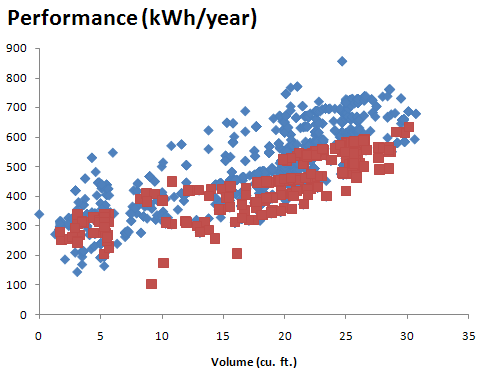 In our preliminary tests with the icemaker off, the energy use we measured was much closer to LG’s figure. But that’s not how you’d use the feature at home since doing so melts all the ice. When we gauged energy use with the LG’s icemaker on, we got a consumption of 1,110 kWh per year. This sounds like a classic case of regulatory capture. The real horror of it is that flawed energy ratings defeat the action of market-based energy and emissions price signals. Unlike gasoline prices, appliance energy consumption is not salient or easy to attribute in a household, so the yellow energy tag is almost the only energy information available to consumers. It ought to be reliable, not biased by a factor of two. Where are the class action entrepreneurs when you need them? Thanks for introducing the concept of regulatory capture. On one hand we have government failures (e.g. regulatory capture), on the other hand we have self-regulation failures (e.g. free market failure), I think we might need to learn regulation from nature (http://en.wikipedia.org/wiki/Autoregulation). Of course it fails sometime locally (e.g. people died due to homeostasis failure), but seldom collapse globally. The key of regulation might be conflict of interest (http://en.wikipedia.org/wiki/Conflict_of_interest). Next Next post: EIA projections – peak oil or snake oil?